1. What is the name of the store seen during Black Friday? 2. The Engels are having relatives over for Christmas. Why does Beth hate that idea? 3. Tom, in his youth, was an Eagle Scout doing survival training. What did Uncle Howard assume that Eagle Scouts do all day? 4. Sarah is cooking some dessert for the guests. What is she cooking? 5. As Beth flees under a DML truck, what does she notice under there? 6. What is the name of Uncle Howard's Hummer? 7. Howard and Tom search for Beth around Derek's deserted house. What don't they find there? 8. “A little sugar and spice makes everything nice.” What does Aunt Dorothy make the children? 9. Which Christmas song plays before the power on the iPad goes off? 10. Howie has been kidnapped by the Gingerbread men. Who grabs his legs? 12. In case you forgot, Omi is the parent of which adult character? 13. Tom has a plan to escape the house and rescue Howie. Where will they plan to take shelter? 14. Jordan and Stevie are part of a sports team in Buckdale, as indicated by their varsity jackets. Which sport does Jordan play? 15. Place the names of the victims of Krampus's helpers who take them to the Underworld in chronological order. 16. As soon as Chrissy, Howard and Dorothy get sucked to the Underworld, the power flickers. What Christmas song plays on the radio? 17. Omi sacrifices herself to the Krampus to save the rest of her family. What is not inside Krampus's bag? You might have to pause the movie at the right time to see. 18. 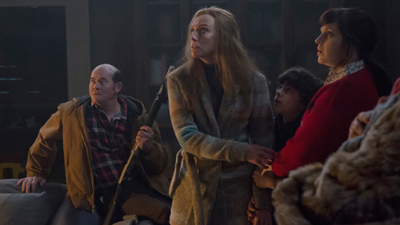 Turns out, the whole Krampus disaster was a dream (or was it?) as everything is back to normal and the family is celebrating Christmas together. When was the last time Dorothy was hung over? 19. What did Jordan get for Christmas this year? 20. The actor who plays Rosie goes by which name?